This tutorial will show you step by step how to convert MP4 video files to MP3 audio files in three different ways using VLC media player, FFmpeg, and Free HD Video Converter Factory. 2. Click on Media and choose Convert/Save from the drop-down menu. 4. Go to the MP4 video file located on your computer. Or just double-click on the video. 6. 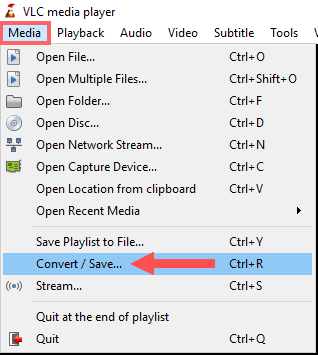 Click on the Convert/Save button located at the bottom of the Open media window. 7. At Profile, you click on the selection menu button and choose Audio - MP3. 8. Click on the Edit selected profile (tools) button. 9. 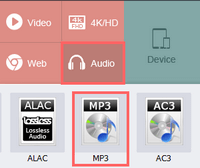 Make sure that MP3 is selected in the Encapsulation tab. 10. 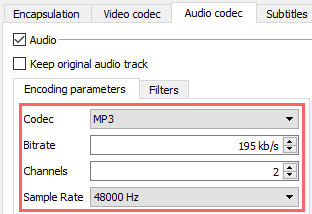 Click on the Audio codec tab. 11. At Codec, you make sure that MP3 is selected. 12. At Bitrate, you select the same bit rate as the bit rate of your video. 13. At Channels, you select the same amount of channels as your video has. 14. At Sample Rate, you select the same sample rate as the sample rate of your video. 15. Click on the Save button. Now you will go back to the Convert window. 17. Select a location on your computer where you want to save the MP3 file. 18. At Filename, you enter a name for the MP3 file ending with the .mp3 extension (e.g., audio.mp3). 20. Click on the Start button located at the bottom of the Convert window. VLC media player will now convert your MP4 video file to an MP3 audio file. Depending on your web browser settings, you might need to choose what to do with the file, select a location on your computer where you want to save the file and then click on the Save button to start to download. 3. After the download is finished you will need to unzip the ffmpeg.tar.bz2 file (e.g., ffmpeg-3.4.1.tar.bz2). You can use 7-zip for this. Now you will have a .tar file (e.g., ffmpeg-3.4.1.tar). 4. Unzip the ffmpeg.tar file. Now you will have a folder (e.g., ffmpeg-3.4.1). 5. Rename the folder to ffmpeg. 6. 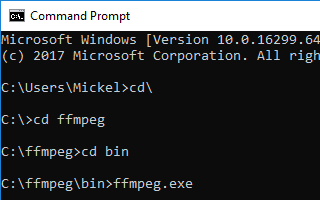 Copy or drag the ffmpeg folder to the (C:) drive (same drive as where Windows is installed). FFmpeg is now installed and ready to use. 1. Copy or drag your MP4 video file into the bin folder of FFmpeg (e.g., (C:) > ffmpeg > bin). If you copy or drag the video file into the bin folder, then you don't have to enter the full path to your video file, but only something like video.mp4 or video.mkv. -i is the path to your video file. If your video file name and format is different, then replace video.mp4 with the correct video filename and extension (e.g., video.avi or video.mkv). -ab 192000 tells FFmpeg that you want the output to be encoded at 192Kbps. You should type the same bit rate as the bit rate of your video. (e.g., 195000, 256000, 320000, etc.). FFmpeg will now convert your MP4 video file to an MP3 audio file. 3. Go to the MP4 video file located on your computer. 5. Click on the video format icon located under Output Format on the right side. 8. Click on Settings located bottom right. 9. At Bit Rate, you select a bit rate that's the same or almost the same as the bit rate of your video. 10. At Sample Rate, you select a sample rate that's the same or almost the same as the sample rate of your video. 11. Click on OK to save the settings. 12. At Output Folder (at the bottom), you can see and change the location on your computer where the MP3 audio file will be saved. 13. Click on the Run button located at the bottom right. HD Video Converter Factory will now convert your MP4 video file to an MP3 audio file.